i can help others with autism! As a family, we have always worked very hard at finding an area where Sam might excel. Although this is not how we planned it, advocacy and public speaking seem to be where Sam shines. As my mother would say, "Life is what happens, when you've made other plans." That would most certainly seem to ring true for our family. On Wednesday, May 14, 2013, it was announced on CNN that Sam Wessels won an award from Cable News Network (CNN). 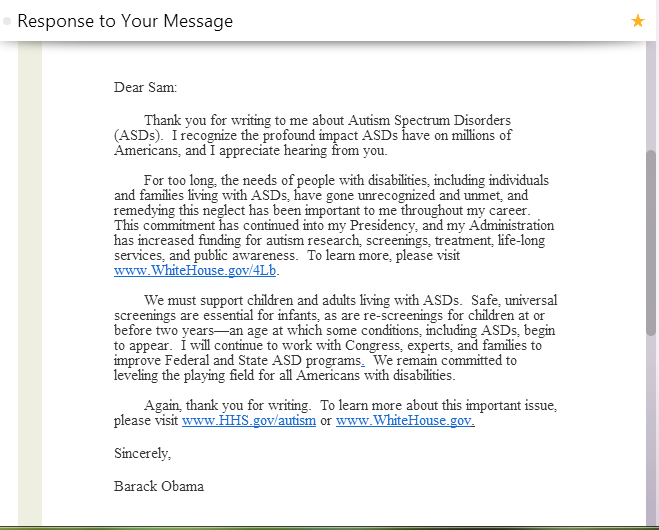 Sam had submitted an autism advocacy video to CNN last April called an iReport. His was one of more than 100,00 videos submitted to CNN last year. Of those video reports, CNN iRpeort producers narrowed the field down to 10,000 videos which were vetted and approved for CNN viewers. In March of this year, CNN producers chose 36 nominees, six in six different categories, as possible iReport award recipients. Sam Wessels WON the iReport award for Best in Personal Story! We are beyond proud of that boy and his hard work for his cause!! Thanks for allowing us to share some of his journey with all of you and for being such an important part of our journey as a family! Our hearts are full. We are blessed beyond measure.